This beautiful and stylish cross design key chain is perfect for the occasion! These key chains are embedded with 4 beautiful blue crystals and accented with a heart shaped stone in the center. All attached to a metal ring along with a key chain. 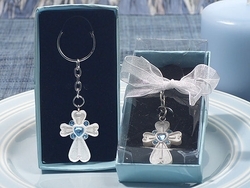 These Cross Key chains come in an elegant blue gift boxes with velvet lining, and are finished with an organza ribbon. Each key chain favor measures 4.5" long. These make wonderful keepsakes are sure to be used by your guests for years to come.